Chelsea boss Jose Mourinho claims he pulled out of a bid to sign left-back Luke Shaw this summer because his wage demands would have "killed" the club. Shaw became the fourth-most expensive defender in history when Manchester United signed him earlier this month from Southampton for £27m. 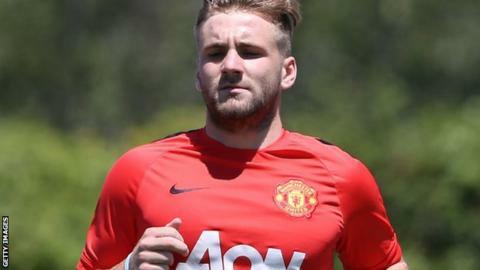 Mourinho says Shaw's reported wages of around £100,000 a week were too large. "If we pay to a 19-year-old boy what we were being asked for, to sign Luke Shaw, we are dead," said Mourinho. "We would have killed our stability with financial fair play and killed the stability in our dressing room, because when you pay that much to a 19-year-old kid - a good player, fantastic player - but when you pay that amount of money, the next day, we would have had players knocking on our door. Shaw, a Chelsea fan as a youngster, made his Premier League debut in November 2012 and earned his first England cap in the friendly against Denmark in February. The left-back has agreed a four-year contract with United, with an option to extend for a further year. The fee could rise to £31m, depending on his performance. He became the youngest player to feature at the 2014 Fifa World Cup in Brazil when he played the entire 90 minutes of England's 0-0 draw with Costa Rica.